Late sunrises, early sunsets, the low arc of the sun across the sky each day, and lengthy noontime shadows declare the arrival of the winter solstice, marking the year’s shortest day and longest night. It is during this season when merriment and festivity take center stage and our culture screams glitter, that many churches, including ours, have chosen to acknowledge with a longest night service that Christmas can be a bittersweet time for those suffering grief and loss, whether the anguish of broken relationships or lost loved ones, the insecurity of unemployment, the weariness of ill health, the pain of isolation, the aches of poverty, violence, injustice. We will take time together to recognize our sadness and yearning to know God’s presence in the midst of pain Tuesday, December 22, at 7 p.m. Join us in the sanctuary to declare that we experience darkness in many ways, even (or perhaps especially) during our culture’s long holiday celebration encompassing Thanksgiving, Christmas, and New Year’s Day. At this time of the year, when daylight diminishes to barely nine and one half hours, it can be difficult to picture six months from now when daylight will prevail once again for 15 to 16 hours. Called a Blue Christmas service in some circles, the longest night observance offers space away from the constant December refrain reminding us that this is the season to be jolly. For some, this Christmas may be the first year without a loved one or a job or perhaps the first year with new knowledge of a serious health issue. For many, the season becomes a particularly difficult time as we try to balance painful losses even as others are celebrating their joy with family and friends. As we move through this darkness of the winter solstice and begin the return to longer days and shorter nights, we pause during the longest night service to remember the dark times in our own lives and the lives of others. We will witness the lighting of our Advent wreath candles, with the first candle representing our own grief, the second our courage, the third our memories, and the fourth our love. Participants also will be offered the opportunity to light candles and plant them in sand to recognize burdens, griefs, sorrows, or whatever makes Christmas a “blue” time for themselves, others, and our world. Join us to proclaim that, even in our despair, God promises to walk with us as we experience insecurity, grief, and isolation. We will find solace together in this hope, with prayer, scripture reading, music, and quiet time. If you know folks who are lonely or sad or disappointed, people who are suffering from the holiday blues, invite them to join us in this safe space where we will seek God’s comfort and embrace as we wait and watch together for the Dawn. I sat in a St. Joseph County Superior courtroom a week ago waiting with 70 prospective jurors to see which of us would be selected to serve as the jury for a murder trial scheduled to start the following day. The thought of using this time productively to wait in Advent did not occur to me…not even after I had suggested to readers just two weeks ago that they might wait productively at a railroad crossing or in a long line at the grocery check-out! No, even before I knew an hour in that this was a murder trial, my mind was filled with the trivia of questions like these: where will I park for four-five hours in downtown South Bend, where will I find the restroom closest to the courtroom in which I would be lodged for hours, how would I affirm that I promised to speak the truth and nothing but the truth rather than being “sworn” in, would my number be sufficiently high that the lawyers might never get to me as they polled their way through the pool of would-be jurors? Although I was more than 15 minutes early, the room was nearly filled with people when I arrived, so full that I had to wedge myself between two men with not much room to spare on the chair between them. After waiting for late-comers, we trudged to the courtroom for a video about the process, then back to the waiting room for no apparent reason, before we returned to the courtroom for a more than two-hour diatribe by the judge, who weeded out exactly three potential jurors during that time and never got to asking the lawyers to take their turns. The judge suggested repeatedly that we guard against “mind static” that could distract us during the trial, that might prevent us from concentrating on the matter at hand. (My mind static jumped into high gear upon the realization that I might have to report back the next day as jury selection surely could not finish by 5 or 6 p.m.) We “met” the defendant and his lawyer, the prosecution team, and the court staff, all before learning more about the nature of the accusations, which involved lengthy descriptions of three counts I couldn’t sort out. We were reminded over and over and over again that the accused is presumed innocent until proven guilty. Two of the three prospective jurors dismissed by the judge expressed difficulty with the concept of “innocent until proven guilty,” based on the fact that they had good friends who are police people and prosecutors, that they tend to trust the information gathered by detectives and prosecutors. It was difficult, they said, to presume innocence in the face of such duly collected evidence. After more waiting, while the judge spoke privately with the 11 remaining potential jurors who were among the first 14 to be selected for examination, six of them returned to the courtroom, where the rest of us had stayed in our seats with instructions to chat among ourselves. Those more experienced with the jury selection process knew the proceedings seemed highly irregular, but none of us could have imagined hearing these words from the judge on his return: “Well, here’s the deal…you (pointing to the six in the jury box) and all of you (pointing to the rest of us) are dismissed.” He added that in his 30 years as a Superior Court judge in South Bend, this was the first time that the entire pool of prospective jurors had been released! Something, which would not be explained to us, had happened during the proceedings…something that might lead to a difficulty the judge did not want to deal with once the court case was under way. And so we were all declared free to go…having waited nearly four hours for exactly nothing to transpire! No one would need to return the next day, for continued jury selection or as the jury of choice. The young mother seated next to me would be spared finding childcare while her husband had a medical procedure, the classroom teacher I met in the restroom line wouldn’t have to scramble for another sub, the man due to fly out of O’Hare Friday morning for an extended trip needed to fear no longer that his travel plans would be disrupted by the trial, the woman whose husband suffers with Parkinson’s would make it home in time to feed him, and I could avoid making a last-minute postponement of a directee visit. Decidedly grateful for these reprieves, those summoned and now released unexpectedly spilled down the courthouse steps onto the streets of South Bend and disappeared quickly into a variety of nearby parking lots and garages, where cars and cell phones waited. The woman with whom I crossed the street was eager to call her son-in-law, a district attorney whom she expected would understand more than we did about the sudden dismissal of all of us. As we parted ways, she told me about the young man she had sat beside, a self-proclaimed risk-taker who declared he had parked in a two-hour space just to see if he could beat the system. But what of the accused…how much longer will he have to wait? How will this delay impact the victim’s family as they wait in Advent? Does this third-week-of-Advent-story speak to where we find ourselves in the waiting? 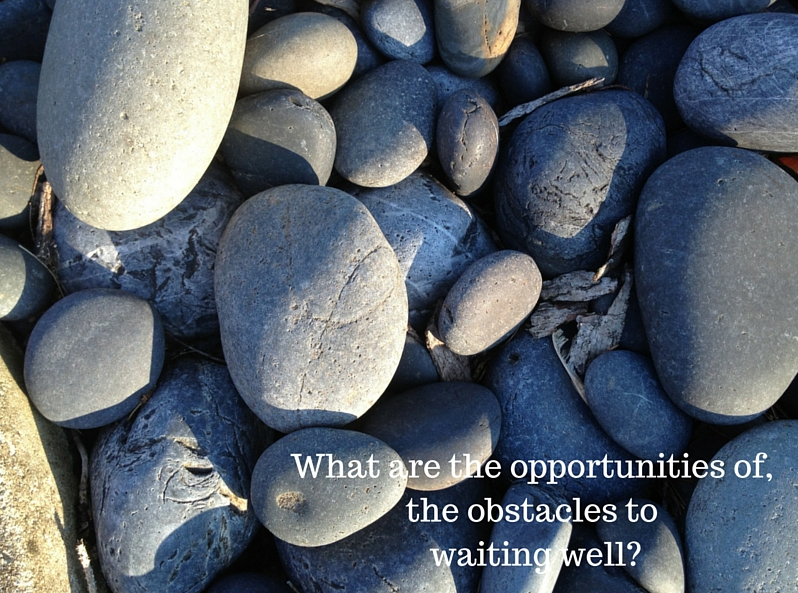 What are the obstacles to waiting well? What are the opportunities? Are there surprises in the lingering? Even when we don’t understand what just happened, what learnings might there be for us as Advent people? Is it possible to notice green shoots of redemption while we wait? Getting cozy may not be the first thing that comes to mind as you consider how you want to spend Advent, that time when we are typically waiting and watching, considering exile and darkness, looking toward the arrival of warmth and light. Last year about this time a friend alerted me to the Danish concept of hygge, the practice of which I attribute to making this dark time of the year a much more manageable season for me personally. Typically, I dread these long nights, the grim, gray days that sometimes accompany winter in northern Indiana, and the serious cold air that blows over Lake Michigan in December. As the season changes and our moods shift to the waiting of Advent, I’m especially enjoying my own living room with hygge created by the warmth and light of our fireplace, Christmas tree, candles here and there, invigorating holiday music, the pleasant fragrances of cooking or baking, and maybe a mug of something hot. Visiting with family and friends, sharing a meal, taking in seasonal experiences, cooking or baking together…all of these times of togetherness help build the camaraderie associated with hygge. How will your relationships, your observances of Advent and Christmas be warmed and lit by hygge this year? As we prepare in Advent to celebrate the greatest gift, how will you create a warm glow for yourself that will seep into the lives of others around you? For starters, you might want to watch Christine Sine's 2015 Advent video entitled Lean towards the Light. Or listen to this YouTube video of Morten Lauridsen’s O Magnum Mysterium. How do you observe Advent at your house? When I was a child, my home church did not celebrate the season of Advent, which marks that time of waiting for the birth of the Christ child and the start of the new liturgical year four Sundays before Christmas day. Taking note of Advent is said to enhance the celebration of Christmas for those willing to work at creating a God-focused time during what typically threatens to become a hectic period of the year. Watching and waiting, finding time to pause as we mark the advance of time during this season can be a fruitful exercise. We are acquainted with Advent wreaths and calendars, which help us document weekly or daily milestones along the approximately four-week journey between the first Sunday of Advent and the arrival of Christmas. If children are part of the household, making fun outings or an effort to be of service can help document the passage of time. Consider excursions to pick up the tree, see a holiday-themed play or musical event, participate in KRMC’s hanging of the greens, view your town’s light displays. As a family service project, you might make cookies to give your neighbors during Advent, donate food or cook at a local pantry, take your gently used clothing to a nearby shelter, collect outgrown toys for a nearby charity, gather a group to sing carols at a nursing home or retirement community, adopt a family for the holidays to share a meal or gifts, do a random act of kindness or pay forward a drink at a local coffee shop. To mark movement through the season and tailor it to your own household, design activities your family will enjoy. We and our grown children and their families and friends still get a kick out of horn caroling Advent hymns as we turn our fingers into brass instruments. You might decorate your house to reveal the warmth of the season and invite in friends and neighbors, create an Advent devotional by repeating the O Antiphons, listen to meaningful Advent music, shop at a fair trade crafts shop for gifts or home décor, or explore international Christmas traditions and recipes. Experiment with waiting in Advent by practicing waiting well in a lengthy grocery check-out line or for a frustratingly long freight train on your drive to or from work. Using triggers like these may remind you of how you want to wait in Advent. Find ways to create and build spaciousness into your life so that you might observe the difference between chronos time (related to clocks, calendars, and schedules) and kairos time (God’s time, during which we pause to find glimpses of the Divine). As we wait during Advent for God to break into our time, we also become more intentional about developing our watching and waiting skills. World events, grief and loss, loneliness, and a variety of other life happenings sometimes make the cultural frenzy of the weeks before Christmas a very difficult time. KRMC’s Longest Night service on December 22 will acknowledge that Advent and Christmas can be a tough time of the year. And it is the Advent darkness-to-light theme that made this book a good choice for this year’s virtual study guide. Take time this Advent to notice in your daily activities themes of exile and longing, of waiting in the darkness, of watching for the light, as you seek to be ever more aware of God’s movement in the world. Nancy Flanagan and Danile Martens mesmerized worshippers with their transporting music a few weeks back. Accompanied by Nancy’s mountain dulcimer, their voices rose in beautiful harmony as they sang old Appalachian hymns, lofting some of us to another world and filling us with gratitude for the magnificent splendor of their gift to us. I expect our warm response to Nancy and Danile’s offering of beautiful music has something to do with our innate understanding of the deep wells of desire these women feel for God’s presence and love when they sing. We also notice their profound enjoyment of singing together. For about 35 years, Nancy averaged three to four programs a week at festivals, churches, civic clubs, schools, private parties; she recorded five albums during that period, one of which can be found in the KRMC library, she reports. Three years after husband Ron’s death in 1989, Nancy married Patrick and moved to Tennessee where she opened a store called Ballad Weaver in the Smoky Mountains. “We sold all kinds of folk instruments, music, looms, spinning wheels, Scots-Irish gifts.” Nancy and Patrick moved back to Indiana in 1997 as grandchildren began arriving. Danile reports a similar joy in singing together. “I can’t remember the first time we sang together, but I remember what we sang and how it felt,” she says. “We sang Bright Morning Stars and I Can Feel the Soft Winds Blowing, one of the songs that we did Sunday, November 1, at Kern. I have always enjoyed Nancy’s music because she sings for the music itself,” Danile explains. “You can see that Nancy loves it and puts herself into it. She embodies the way I feel about music and how I would like to sing, if a degree of self-consciousness didn’t interfere. Knowing that she loves the music helps me inhabit it as well. I like to sing harmony, and watching Nancy helps me to be one with her in the music,” Danile concludes. Danile “grew up listening to my older sisters sing and then singing with the five of them in various conformations; we learned to sing together well by watching one another. I know performers are not supposed to do that, but I feel that it makes better ensemble, and really, it helps me to be in the music with my fellow musicians rather than on my own before an audience." This week of Thanksgiving, I am grateful for these two women who lead us in worship from time to time with their beautiful music, always an encouragement to listeners wherever they may find themselves on the journey. Each of us has something to give and each can be an encourager of another as our congregation continues to grow into fostering the development of grace, joy, and peace, so that God’s healing and hope might flow through us to the world. Have you ever noticed that beauty, whether it be found in nature or artwork, music or dance, food or the faces of people around you, offers rest for the weary? If you are intrigued at the thought of noticing beauty as a spiritual practice, Spirituality and Practice offers a journal exercise that suggests describing and reacting to a variety of beauties: 1) recall a beauty experienced in childhood, 2) a beauty experienced at school or work, 3) a beauty in nature, 4) a beauty in your home, 5) a surprising beauty, 6) something most people consider to be beautiful, 7) something few people consider to be beautiful. In German the word “beautiful” is related to shining. A beautiful person is one whose inner brilliance permeates his/her entire being. What has been your most memorable encounter with a person who was shining? How does this shining draw you to God? How can you be part of the shining as you relate to those around you…here at KRMC, in your family, at work, in school settings, or wherever you find yourself? Oh, the memories that a cherished recipe box brings to mind! I came into possession of my mother’s recipes on my last trip to visit her and my dad in late October. Though they moved in May to a personal care unit with no cooktop or oven, she wanted me to sort through the box with her one last time before turning it over to me. So many diminishments accompany aging, but I hadn’t previously given much thought to what it would feel like to give up a lifetime of food memories saved on hand-written cards with a mixture of clippings from magazines and newspapers and processed food boxes. Though my own food preferences have evolved over the years and my mom’s have changed as well, it was as a child that I learned about the beauty of warm table hospitality from her. When her four children were young, she often planned a big Sunday noon meal, expecting to invite home from church a guest speaker and family or visitors on the spur of the moment. Peeled potatoes covered with water waited in a pot to begin boiling the second we got home. A main dish baked in the oven while we were gone with timer set to start and finish at the right moment, and the fridge and kitchen countertops sat full of salads and desserts prepared the day before. Frozen home-grown lima beans and corn took only minutes to cook, while dinner rolls heated up quickly in the oven after the main dish came out to rest before eating. We regularly consumed canned pears and peaches from our own yard or local farmstands, applesauce prepared and frozen from our apple tree, grapes from our own vines, ground cherries from our garden, and my mom shared liberally with friends and relatives who joined us around the table. All my life family remembered each other, feted each other with good food. There were the grand Christmas dinners when three generations gathered at Grammy Landis’ house, where the table was well set with the seven sweets and seven sours in addition to the usual main course staples, plus pies, nut cake, and an elaborate fruit salad for dessert. Our maternal grandfather was a butcher, so we regularly ate his sausage and scrapple, and Grammy’s shoofly, funny cake, hardtack, and fastnachts on Shrove Tuesday. My dad’s stepmother, who arrived on the scene when I was 9, introduced us to foods we hadn’t eaten before like homemade Italian spaghetti and boiled lobster tail for special occasions like New Year’s eve. Extended family visited during the holidays bearing baskets full of fruitcake, nuts, ribbon candy, and other exotica, and my dad’s co-workers mailed the likes of cumquats and oranges from Florida. Our mom kept neat records inside the kitchen cabinet doors listing the dozens of cookies she baked each Christmas. 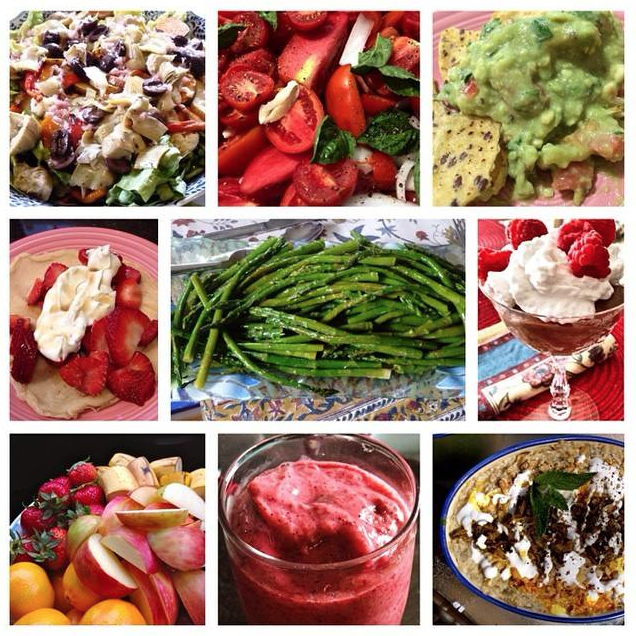 Some gems I had lost track of over the years have re-emerged from the recipe box; I’m eager to revamp to my present-day eating habits the hot fruit compote, the layered bean dip, the corn fritters, the custard dessert. When I shared with my spiritual director the story of the gift of receiving the recipe box, she reminded me of Jesus’ words to the disciples at the Last Supper: “Do this in remembrance of me.” As you share food with others, you are remembering your mother and the lessons of hospitality she lived out, my spiritual director suggested. Her observation delights me. Even though the food I serve today is frequently quite different from what I grew up eating, gathering around the table reminds me of the warmth of home. I want to extend our table to others. How have you carried on the ways you learned to welcome others? Have you tailored the hospitality you experienced in your growing up years to your present lifestyle and interests? Who can you invite to your table? Fra Angelico's The Forerunners of Christ with Saints and Martyrs (about 1423-24), tempera on wood, National Gallery, London. 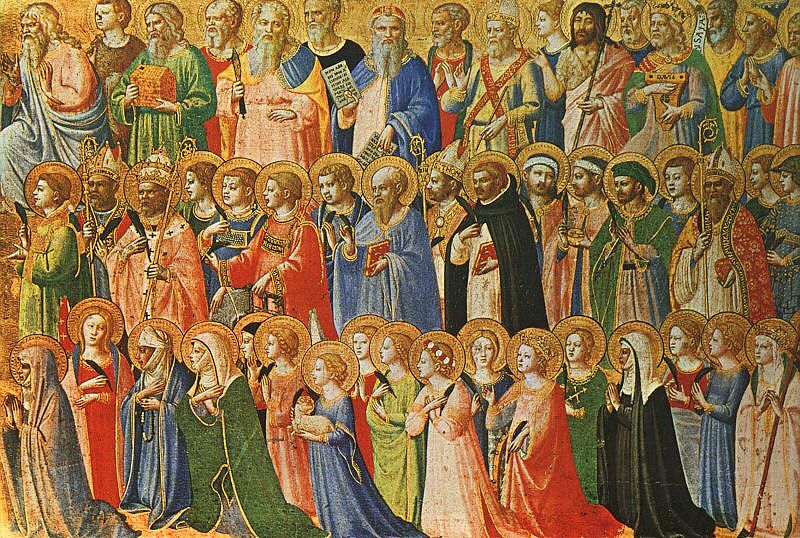 I didn’t grow up celebrating All Saints Day, but, as someone who suffered grief and loss early in life, observing this day on November 1 became important to me in the middle 90s at my former church in the western suburbs of Chicago. All Saints emphasis Sunday seemed a good day to remember those who had gone on before in the past, as well as to give thanks for those still among us who have mentored our own faith. When I look back on my family of origin and church family who influenced me as a very young child, I remember grandmother Kate, who was a teacher and eagerly helped me and my younger brother memorize the 23rd Psalm before we turned six. I recall Sunday School teachers and Bible school teachers who shared stories with us each class period, and church librarians who promoted good books. As a would-be writer back in the day, I was already fascinated as a youngster by Aunt Beth, who wrote for Words of Cheer, as well as authors like Katie Funk Wiebe, whose work appeared in a variety of Mennonite publications which arrived at our house on a regular basis, and artists like Jan Gleysteen, whose work was featured regularly in Christian Living magazine. During my years as a young mother, I was attracted to the faith of slightly older women at church, the good-hearted wisdom of congregational saints who regularly reminded us that we could trust God’s work in our midst, the contemplative spirituality of new pastors who arrived on the scene as our children began leaving for college. Here at Kern Road, I was moved several weeks ago to witness fellow church members signing my grandson’s new Bible, which he and other second graders received from the congregation during worship that day. To see the children perusing their Bibles before they left the front of the sanctuary was heart-warming, and I watched several eagerly reading their messages from family and friends…this is, indeed, a good way to pass on the faith. 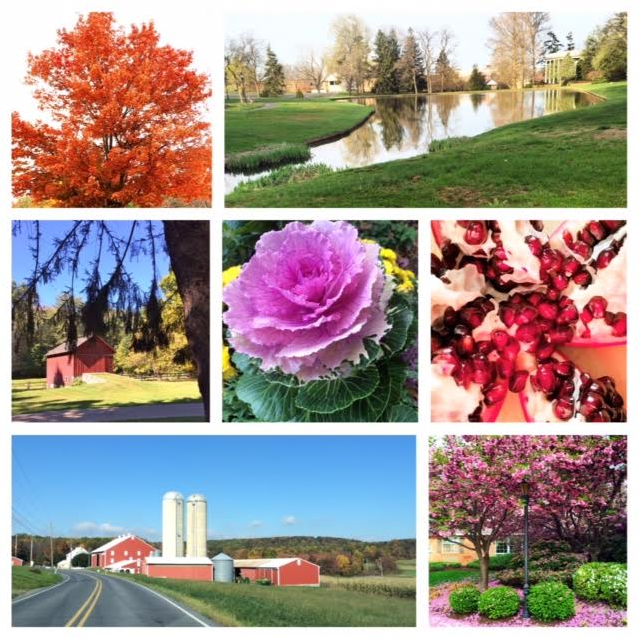 Along with author Jan Richardson, I ask you…what stirs your memories in this season? Who are the folks, living or dead, who linger close in these days? How do your memories help inspire your path ahead? How are you passing on the faith?